Brittany’s love for dance started at the young age of 4 years old at Estelle & Alfonso Performing Arts Complex in Poughkeepsie, New York. After moving to Raleigh, North Carolina at 10 years old, she continued studying Ballet, Jazz, Modern, and Contemporary dance at CC & Company Dance Complex where she had the opportunity to train with numerous influential dancers and choreographers. Brittany continued on to Appalachian State University where she pursued her passion for dance by choreographing and performing for the Appalachian Dance Ensemble. Brittany loves living in Charlotte with her husband Taylor, daughter Elise, and all of her fur babies, and you can usually find her hanging out at a local brewery in her spare time! She is excited to be a part of the Ebb & Flow Movement Studio family by assisting with administrative roles as well as teaching a few contemporary dance classes. Liam began exploring movement with traditional martial arts as a kid and then transitioned into MMA and weight lifting. While focusing on his own twist of Olympic barbell style lifting mixed in with interval body weight training, Liam acquired some small injuries and decided to switch things up. After a year of focusing on the kettle bell, Liam found his injuries had subsided and was able to train every day without pain. Liam then decided attended his first Onnit certification which included kettlebells, steel maces, battle ropes, suspension and body weight teacher training. What are you most excited about E&F? I’m excited to see all different types and levels of movement come together in one location. Also excited to help promote a fun, free environment for anyone and everyone. What do you love about Charlotte? I love the size of Charlotte, it isn’t too big nor too small. I also think there is people who are into the idea of community and networking. What do you love most about movement/yoga/dance? Achieve during the movement. The feeling you get after moving. When your finished, the clear headed, accomplished, free feeling. Molly began dance early in her childhood at the age of three. She was a student at Angie's Dance Academy in Clyde, North Carolina for 15 years where she had the opportunity to train with a passionate academy staff, as well as industry-leading guest choreographers. She continued her dance education at Appalachian State University by dancing and choreographing for the Appalachian Dance Ensemble while obtaining a Bachelors of Arts degree in Dance Studies. Molly also holds a degree in Psychology with a concentration in Business Administration. What are you looking forward to the most with Ebb & Flow? - Movement is good for the soul! I can't wait to get in the studio and help make someone smile simply by dancing. A Charlotte native, Kat Spangler began her dance training at age 3 with Dance Davidson, a classical ballet studio near her hometown. Eventually she would move on to a competitive dance team and youth ballet company, with her penchant for teaching and creating choreography becoming more apparent each year. At the time she entered Appalachian State University, she was teaching more classes than she was taking and felt quite at home with the Dance Pedagogy coursework completed while earning a minor in Dance Studies. It was here that the diverse and respected Dance & Theatre staff at ASU helped further develop Kat’s technique and personal style, taking as many classes as her schedule would allow, and performing and choreographing for multiple seasons of Appalachian Dance Ensemble productions. After many years post-college building a career in the photography industry, it became hard to ignore that dancing recreationally was not enough for her and she made the leap towards a new professional (and very personal) goal, Dance Therapy. Kat is a mental health and wellness advocate, with a steadfast belief in the therapeutic properties of movement in all its forms. Her teaching style is “feel good”, loaded with expressive movement and emotion-sometimes sass, sometimes pain, sometimes joy. Kat is currently in pursuit of a Masters degree in Dance Therapy with the goal of becoming a licensed Expressive Arts Therapist. Born in Romania and brought to Wisconsin, Georgiana “Georgie” Elena (RYT 200) fell in love with all things cheese and yoga. She found a home on her mat at the age of 15 after her first sun salutation. Georgie completed her 200 RYT certification here in Charlotte at a local studio. She wants students to feel empowered, enlightened and encouraged to see life through a different lens. Georgie holds space in the studio to practice more than just the splits, handstands and backbends. Adding a pinch of humility to a handful of blood pumping tunes, students come to practice both self-acceptance and self-improvement. Her classes are fun, encouraging, and upbeat. Yoga healed her life her from the inside out and Georgie wants others to feel that same impact. She can’t wait to see you in her classes! What are you most excited about with Ebb & Flow? The most exciting part about Ebb and Flow coming alive is realizing how much love has been built into the design of every single nook and cranny. Talking to Lauren, I hear about her honest love and passion for this studio and the purpose behind every decision she’s making. Its extremely exciting to be a part of something that is so honestly good for our community and in a way has a hand in making our world a better place. The thing I love most about Charlotte is the home I have cultivated. Everything I ever dreamed of trying I have found the ambition to take the chance on in this city. Charlotte is filled with the fresh energy that inspires me and yet maintains a touch of the past that keeps me grounded. Being on the mat and expanding the body in all directions gives us this incomparable healing. My mat is the place where I’ve learned to be tall, confident and courageous. I couldn’t have learned to love myself so honestly any other way. When teachers queue for us to ‘take up space’, I think it’s a glorious reminder that we are supposed to be here, no matter where we come from or what our past has looked like. We all have a purpose. At the core level we are all human, but our ability to move and flow gives us insight to the real strength and resiliency we hold. Paired in a studio setting, movement and yoga create this energy that continues to vibrate in our daily lives. Nellie Griesinger graduated from NYU, Tisch School of the Arts with a BFA in dance in 1997. At NYU she trained under Andre Bernard for Anatomy of Kinesiology and under Kathy Stanford Grant, an instructor certified by Joseph Pilates. She lived in California for 11 years and was a design assistant at RazorfishLA and G4TechTV in Los Angeles. She certified in Classical Pilates at Pilates Institute of Southern CA, (PISC). She is a certified RYT-200hr yoga instructor through Yoga Alliance. She certified in nutrition physiology from the Institute of Integrative Nutrition learning over 101 dietary theories. She studied Equine Structural Integration (aka Rolfing for Horses) enhancing her innate sense for movement and alignment. She captivates an elite clientele. She too has had personal success from her education. Nellie is a mom of three children. Nikki began her dance experience at the Morrison Ymca in 2010. She studied and performed Hip-Hop and Jazz dance for four years. Beginning in the fall of 2017 through the summer of 2018, Nikki was the dance Instructor at South Mecklenburg High School for the ‘Sabre Dance Crew’ where she taught Hip-Hop and Contemporary dance. Nikki was also apart of the Fila Latin Dance club and learned Latin dances such as Bachata, and Salsa. Throughout her years of being a dancer, Hip Hop became her favorite style of dance. Nikki describes her movements as a reflection of her emotions to the beat and the sounds of music. She often finds herself dancing in her seat, or creating choreographies in her head whilst listening to music. The creativity is limitless. Nikki’s goal is to bring people together through dance, and ultimately achieve unity in diversity. With or without prior dance experience she wants individuals to feel comfortable and confident in themselves inside and outside of class. There is absolutely nothing better than the feeling of complete happiness doing something you love, and the world of dance for Nikki is just that. Victoria Woazeah Cerrato has been dancing for the last 19 years. Dance has always been a big part of her life. She studied hip hop, jazz, modern in middle school through high school and in college she studied ballet and African dance. In college she choreographed and led the hip hop dance team as well as competed. Teaching hip hop brings utter joy and such excitement when she gets to see how she makes others feel. She is excited about joining the Ebb & Flow team and ready to have some fun! Jarvis Garvin is a dancer, fight choreographer, actor and writer. Born and raised in Charlotte NC, Jarvis started dancing at the age of four at the county fair where he performed Micheal Jackson's "Billie Jean". From there he learned the street dance styles "Popping" and "Top Rock". Growing up in the ‘90s, Jarvis fell in love and excelled at "New Jack Swing" style which included the dance moves "The Running Man" and "The Kid N Play".As an adult Jarvis studied the dance styles known as "Locking" and Swing Dance. Jarvis also loves to teach Jazz after being inspired Bob Fosse and Fred Astaire. Growing up listening to his mother's ‘70s and ‘80s records Jarvis developed an unwavering belief that dance is the ultimate form of expression. Jarvis has performed in several plays including Justin Mann's "Breaking Silence" at the Blumenthal Theater, Cast Studio's "How I Got On" and Q Production's "A Rhyme Deffered" in which he won the Metrolina Theatre Association Award for Exemplary Performance Element in a musical. Kara started dancing ballet, jazz and tap at age seven, then took an almost 10-year-long hiatus to focus her creative energy on musical theatre. A nerd at heart and a lover of all things theatrical, Kara came back to the studio after taking a cardio dance class for a P.E. requirement at Davidson College. When she's not at E&F, she's running her pop-up cardio dance fitness classes – MiSFIT Dance – working to take E&F values of accessibility, affordability, and dancing your heart out into the Charlotte community. Most people who live here are from other places. Because of that, I feel like there's a warmth and acceptance here you don't find in most cities. There's also an enthusiasm for learning and growth that I find so refreshing. What are you looking forward to with E&F? I think the community. From the minute I walked in the door, this space felt so welcoming and authentic. I think when you're talking about creative expression, having an environment that feels supportive is so, so huge. Elsie Mufuka born and raised in Gardens Corner, SC with roots from Zimbabwe hold a B.A in Dance and Communications from Coker College and candidate of Masters of Arts Administration from Winthrop University developed MufukaWorks Dance Company in 2010 with the inspiration of providing dance education and performances for the community. Since then, Mufuka has provided high art cultural dance experience through dance education and dance performance for the community. This inspiration grounded in Mufuka’s Zimbabwean lineage; professional experience; and, international travels has afforded her the opportunity to offer dance education programs and performances within a diverse community. Since the opening of the company, Mufuka has started and taught dance education programs. Some of these programs include dance education at the Burton Wells Recreation Center in Beaufort, SC and, more recently, an education program at the Albemarle Road Recreation Center located in Charlotte, NC, Dance Education Workshops at Whale Branch Elementary, Beaufort, SC, Bluffton School of Dance, Bluffton, SC, and Charlotte Dance Festival, Charlotte, NC. Additionally, Mufuka has brought dance performances to the International House in Charlotte, NC, Lexington International Festival in Lexington, NC, Gullah Festival, Piccolo Spoleto, Links Inc. Dance Performance School Series, Levine Children’s Hospital, Charlotte Emerging Young Artist Dance Festival just to mention a few. The Company repertory is Return to Sender, One Blood, Our World: the stories of our community, Invisible, and “I AM”. MufukaWorks Elite Root Performance Company:The MufukaWorks Elite Root Dance Professional Company is the first company of MufukaWorks. These dancers are professional for the company whom perform for festivals, theatre performances, outside area performances, weddings and other required performances. The dancers in our first company are required to participate in special performances outside the dance education program and attendance for these events is mandatory. The performances are choreographed by MufukaWorks unless allocated by director to other qualified choreographers. The company style is Afro Russe Dance (a fusion of African, Ballet, and Contemporary) conjunction of live drumming. Mufuka has been awarded full scholarship to Dance USA and Coker College Outstanding Young Alumni (the first African American Women to receive this award). Her mission is to continue to inspire through dance education and be a role model to the youth. Jenn's love for yoga began after her first Savasana where she cried as she realized that she was rarely ever still and restful. As she kept returning to the mat, she began to notice much of her pain and discomfort post car accident began to alleviate. Because of what yoga has done for her, she's deeply committed to sharing the practice with you. Because Jenn has a background in behavioral psychology, neuroscience, and is also a mindset coach, expect an experience that will allow all your parts to be seen and loved. 1. 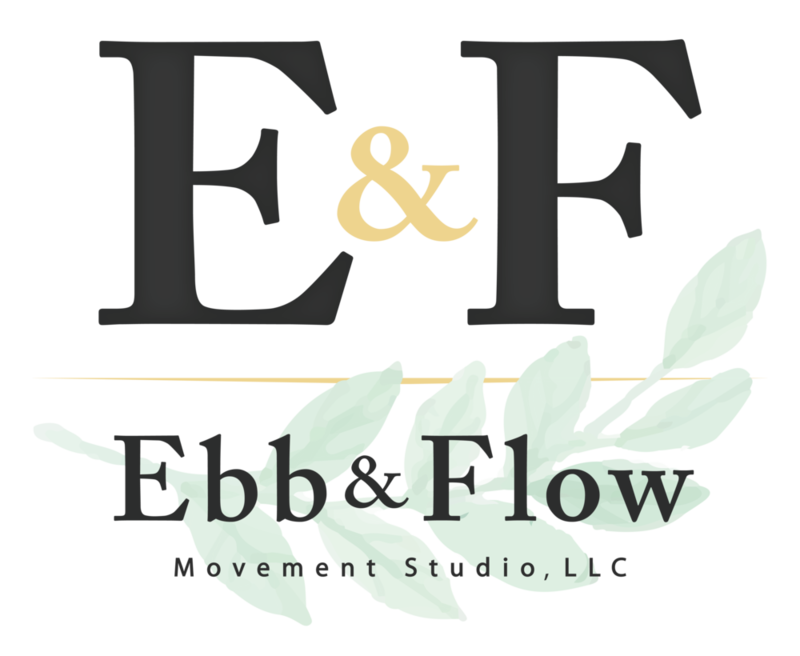 What are you excited about with Ebb&Flow? I am excited about such a one stop shop of movement based classes under one roof! I've been talking about trying barre for forever. I've been talking about getting back into pilates for some time. It felt like a lot to have to go to a bunch of different studios to make it all happen. Now that it's all under one roof, I don't have to! I'm stocked to bring some yoga to the space. 2. What do you love about movement? Movement in the body allows more movement in the thoughts and emotions, which is important so we don't get stuck in self sabotaging patterns and feelings. Movement creates space, and I like space. It also allows me to feel more connected to the divine. 3. What do you love about Charlotte? I began practicing in 2011 to find a creative outlet to offset my job where I was working on a computer all day. After falling in love with yoga and being able to see the many mental and physical benefits firsthand, I decided to sign up for a yoga teacher training program. I completed my 200-hour teaching training program in the fall of 2014. Yoga is a way to help settle and focus my energy. I feel most at peace on my yoga mat. I love being able to show others the benefits of yoga by guiding them through the asanas and creating a safe space for them to be themselves. Yoga can be a very personal practice and I love to allow my students the space to get into the poses in order to be still and listen to what their body needs. I am excited about a new studio in this part of Charlotte that will have such a vast choice of classes where people are happy and excited to be a part of this community. I especially love the feel of the overall studio, you walk in and the space is very calm and peaceful. I love how movement in the body can help release tension and emotions that you did not even know you had been holding on to. Movement allows for such a transformation of the mental and physical state. You can walk into a yoga class after a long day and slowly, mindfully moving through the asanas, you can walk out of the class feeling like a different person. Anyone who's ever crossed paths with Karen knows she is a ray of sunshine with some killer moves, and a sense of humor that really brings on the cheese. She has a Bachelors degree in Exercise Science and completed her instructor certification through Barre Above. Get your barre burn on with Karen! Growing up as a big spirit living in a small town, Lauren has always dreamt of a life filled with love, expansion and connection. After years of looking to outside sources to satisfy her deep craving for love, connection *insert whatever feel good word of the day is* she discovered yoga and began to understand that the “bigness” she longed for had always been there all along, right within her. After completing her RYT 200-Hr teacher training in the winter of 2017, Lauren had a strong desire to share this practice with others. She finished up her training in April of 2017 and began teaching at Y2 Yoga in September of 2017. “It LIGHTS ME UP when I see my students find strength and confidence on their mat, in their own bodies”. Take Lauren’s class to discover your inner strength, celebrate the small accomplishments and find freedom in not taking yourself too seriously. Summer Juraszek earned her Pilates certification with Studio Verve in Phoenix, AZ, Pilates Education Institute aligned with PMA. She completed the full Comprehensive program - including training in mat, reformer, barrel, spine corrector, small props, chair, tower, and cadillac. "My pilates journey started with dance. I have been a dancer since I was 3 years old. Growing up, it’s all I I ever knew. From spending my life at the studio when I was young, to dancing on the dance team in high school, my life revolved around movement. When I started college and stopped dancing, I had to find a way to replaced what once kept me so active and moving. I started to do mat pilates in my dorm room. It was effective and all I needed was my body and a mat. I fell in love with the pilates exercises and always wanted to teach but it was not till I graduated college that I went for it. I graduated college from the University of Arizona in May of 2018 with a Marketing degree. Over the past few years I have found a love for the health and wellness industry. I wanted to do something that made me feel alive, so I chose pilates and started a health and wellness blog. I am so thankful to do what I love most in life as a career. I am excited to keep learning and continuing to educate myself on pilates, the body, movement, health, and wellness." Briana began dancing at age 3 and has continued to train and develop her style of choreography through continued education and bolstered by a regular yoga practice. She has previously trained with the Alvin Ailey American Dance Theatre, Carey Ballet, and numerous conventions such as Jump, Pulse, and New York City Dance Alliance. Contemporary Soul is a blend of contemporary dance with strong R&B and Soul influences and we are so excited to be able to offer this unique addition to our schedule!